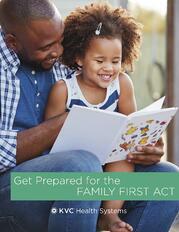 Trying to learn about the Family First Act before it begins October 1, 2019? Download this checklist to find out how you can prepare. Learn about the Family First Act and how it provides a historic opportunity to be innovative and responsive to the needs of children and families. Evaluate your agency's services and how you can align them to Family First to qualify for funding. Strengthen families so that every child and teens grows up in a family. KVC Health Systems is accredited by the Joint Commission and trusted by child welfare agencies to care for over 60,000 children and families in five states each year. While the Family First Act is new, KVC has successfully implemented some of its core philosophies such as right-sizing congregate care, embedding trauma-informed care into foster care, and implementing evidence-based prevention programs.